NVA INFILTRATION: A significant number of enemy soldiers are NVA rather than VC. When hostilities in South Vietnam resumed in 1957, enemy forces were entirely VC; but since at least 1960, NVA personnel have played an ever-increasing role. The first NVA infiltrators into South Vietnam were native South Vietnamese--former Viet Minh who had regrouped to the North following the Geneva Accords of 1954. These “regroupees” were sent south to act as military cadre, political officers, and technicians in VC units. By 1963, the supply of regroupees was almost depleted and native North Vietnamese were being sent to bolster VC Main Force units: however, the first NVA tactical units to be sent south still had at least 20% southern-born cadre. The first regimental- sized NVA unit to be deployed arrived in December 1964. In June 1966, the first complete NVA division crossed the DMZ. As of August 1969, 67% of all Main Force battalions in South Vietnam were NVA. 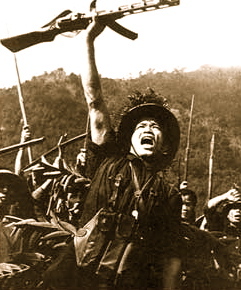 NVA RATIO: In August 1969, 53% of all enemy non guerilla combat soldiers were in NVA units. Excluding IV Corps, and including those NVA in VC unite, NVA soldiers constituted at least 76% of the Main Force (MW) and Local Force (LF) combat units in I, II, and III Corps. Although the average number of NVA in all VC units in those three corps areas could be documented at only 38%, VC MF units that have experienced heavy contact may be NVA units for all practical purposes. For example, in August 1969, the 9th VC Division was at least 76% NVA; two of its regiments (271st and 272nd) were 85% NVA and its third regiment was the 88th NVA Regiment. In the same time frame, the 268th VO Regiment was 80% NVA, with its 3d Battalion being 92% NVA. In May 1969, the 273d VC Regiment was identified in IV Corps. It was followed in August by at least the 18B NVA Regiment. 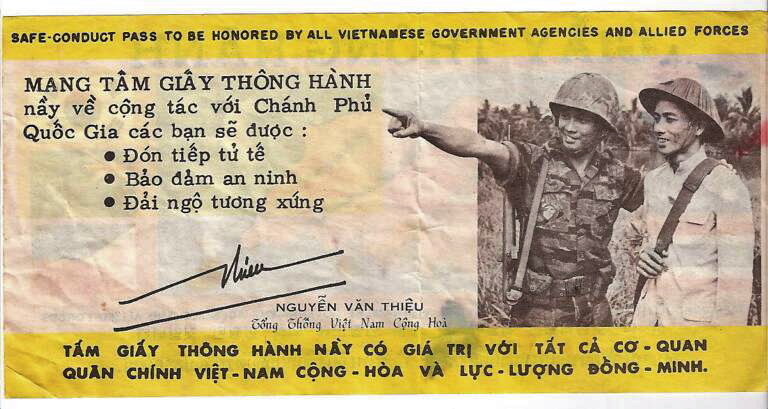 An officer rallier (Ho Thanh San; see section II, paragraph 4) claims the 273d to be 90% NVA. The deploy ment of these units marks the first significant North Vietnamization of the war in the Delta. In 1969, NVA also were beginning to be found in Local Force units. APPEARANCE: Physical. 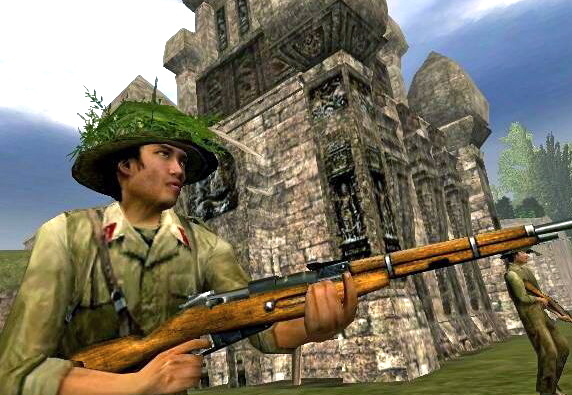 Moat NVA/VC soldiers are ethnic Vietnamese. Very few are montagnards, Chinese, Khmer or Chain, The typical Vietnamese is small--61 or 62 inches tall--weighs about 120 pounds. He has straight black hair, light to medium brown skin, round head, broad face; high cheekbones, and dark eyes with Mongolian single fold of the eyelid. UNIFORM: In combat, it rarely is possible to distinguish NVA from VC by their clothing or equipment, and officers are difficult to identify except by their actions and the fact that they normally carry pistols. Their clothing is uniformly nondescript- A common field uniform is shirt and trousers or shorts of green, gray, blue or khaki material, without insignia, and worn either with no headgear or perhaps with a pith helmet. 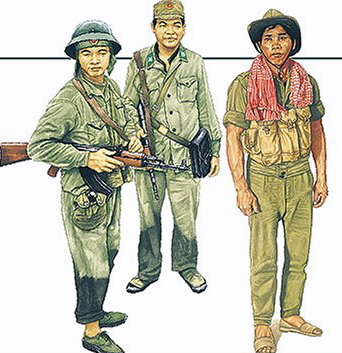 VC, particularly local forces and guerillas may wear black pajamas or black shorts and items of civilian clothing, but NVA tapers may also wear black shorts or nothing at all. CIVILIAN BACKGROUND: Most NVA recruits who infiltrated into Vietnam in 1968 were inducted between the ages of 27 and 23, with 17-19 year aids comprising the largest group. Very few were 16 or younger. By comparison, only half of the VO recruits in 1968 were between 17 and 25 years old and about one-fifth were 13 to 16 years old. Village guerillas range in age from 15 to 32 and hamlet guerillas from 14 to 5O. EDUCATION: The typical NVA soldier is well educated by Asian standards. One study found that 36% had seven or more years of school and only 10% had three years or less. In contrast only 4% of the VC had seven or more years of school and 73% had three years or less. Thirty-five percent had none. FAMILY: Whether NVA or VC most soldiers are from the poor farmer or middle farmer class Less than half are married. Most, if they admit to having a religion, are Buddhist. 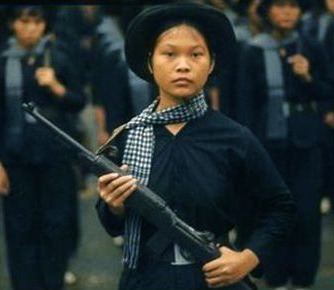 PARTY AFFILIATION: A 1966 study of 370 NVA soldiers showed that 27% were members of the Lao Dang (Communist Party) and 61% were members of the Labor Youth Group. The percentage of Lao Dang members among enlisted men had practically doubled since 1965 and virtually all officers were members. The average VC enlisted man, being younger and less well educated, is 1ess likely to be a party member. MILITARY BACKGROUND: The greatest source of NVA soldiers is the draft. North Vietnam instituted universal conscrip tion in 1958. Since 1964, normal discharges from the army have been halted, and the term of service has become indefinite. All young men are subject to conscription with few deferments granted. The normal draft age is 17-19. Enlistees also are found in the NVA. They normally will have entered the service at a younger age than the draftees. "Recallees" or “re-enlisted draftees’ also comprise a substantial proportion of NVA infiltrators. They are older men who completed their military service and returned to civilian life before the indefinite term of service was established. In theory, the VC relies on recruitment. However, since 1964, they increasingly have had to rely an forced rather than voluntary recruitment- - either through coercion or abduction. The typical VC recruit is first assigned to a guerilla unit and later "upgraded" to a MF or LF unit. TRAINING: The typical infiltrated NVA unit is composed of both experienced well-trained soldiers and soldiers with little or almost no training. Members who have been in the army for a year or more before infiltration usually have had basic military and political training, periodic training while part of a regular unit, and a full pre-infiltration course. Recallees and re-enlistees may have received better basic and unit training during their first term of service but may receive only abbreviated pre-infiltration training or join their unit only during its final stages of training. New recruits may have received one to three months basic training followed by full pre-infiltration training. However, many are assigned after basic training to a unit about to depart; others go directly to their unit without basic training but undergo all or part of its pre-infiltration course; and some have arrived in the south with no training exce4 for what they learned along the infiltration route. By late 1968, the NVA training cycle had been compressed to the point that infiltration training, if given at all, was conducted concurrently with basic training. However, the NVA infiltrator is still usually better trained than the VC recruit. The typical NVA recruit is assigned to a guerilla unit, where he receives about 10 days of informal military training and political indoctrination, although this period may vary from one day to three months. If recruited directly into a MF or LF unit, he may receive from 15-60 days of training more sophisticated than that conducted at village level. By late 1968 the norm for MF and LF training was reduced drastically and probably lasts no more than 15 days. If time does not permit formal training, older members of the unit give the NVA recruit on-the-job training. If the NVA recruit receives basic training, he will have received small arms (SKS and AK-47) familiarization, bayonet, grenade, explosives, hand-to-hand combat, first aid, field sanitation, and squad and platoon tactics. The village-trained VC normally will have had familiarization with his assigned weapon, grenade, mines and booby traps, raid and ambush tactics, rudimentary combat movement, and hand-to-hand combat. If he was trained by LF or MF, he also probably fired the machinegun, RPG, or mortar and was taught squad and platoon tactics. PSYCHOLOGY: General. 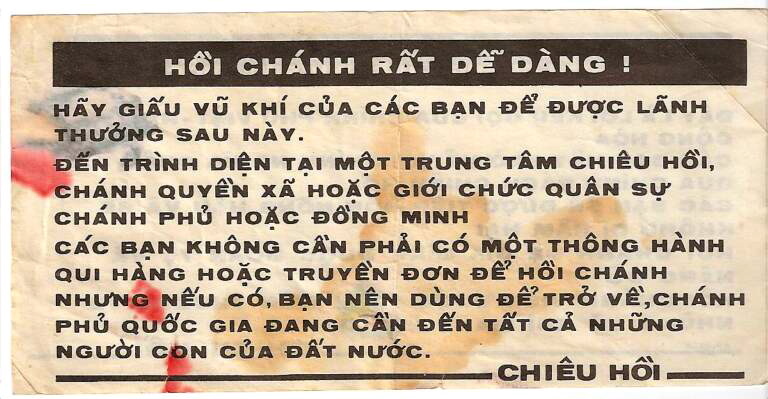 The psychology of the NVA/VC soldier is a composite of his traditional Vietnamese values and attitudes and of others brought by the French or taught by the Communists. VIETNAMESE HERITAGE: Traditional Vietnamese values and attitudes are a product of centuries of Chinese influence. Buddhism, Confucianism and Taoism from China provide the two fundamental characteristics of traditional Vietnamese values: fatalism and group loyalty. Each of these religions or systems of thought is fatalistic. Destiny determines everything. Man can do little to change the natural order. Pro gress and change are ordained by destiny. However, if a change appears to be predetermined, it may become the people’ a duty to help bring it about. Group loyalty, particularly within the family, stresses the subordination of individual interests to those of the group or family. This trait makes most Vietnamese responsive to authority and regimentation. The individual should accept the role that his status in life has assigned him. Many of these roles relate to the traditional importance of the family. Economic security far the family is essential. To the rural Vietnamese this means ownership of land. FRENCH INFLUENCE: Many NVA/VC are strongly nationalistic. 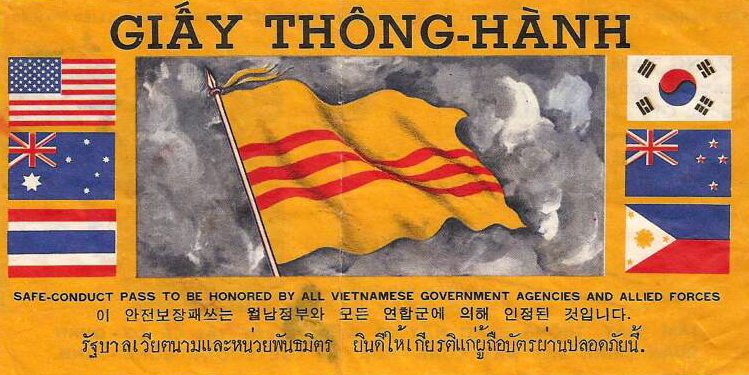 French colonialism both brought the Western concept of nationalism to Vietnam and served as the target against which the Viet Minh, in 1946-54 rallied the nationalism of other Vietnamese. Today, the NVA/VC again attempt to rally Vietnamese nationalism by linking the US presence in Vietnam with that of the French. COMMUNIST INFLUENCE: Attitudes of NVA/VC cadre and party members reflect those of the Lao Dong or its South Vietnamese affiliate, the People’s Revolutionary Party (PRP}. Soldiers receive constant political and ideological training and guidance from higher Party echelons. The NVA/VC hear little else but the Party line. A primary Party dogma is faith in ultimate Communist victory: the concept of protracted war maintains this faith despite temporary military setbacks; “in the long run, the GVN and its allies will be worn down.” At that time the two Vietnams will be reunified. They interpret the bombing halt in North Vietnam and the existence of the Paris Peace Talks as political victories forced on the US by superior NVA/VC power. The NVA/VC leadership further states that political dissent in the United States will force the eventual disengagement of US force’s from the conflict. At that time, facing only GVN forces, the ultimate Communist victory will be attained. MOTIVATION AND MORALE: The motivation and morale of the NVA/VC soldier is a product of his psychology, civilian background and military experiences. The background of most soldiers contributes to their susceptibility to the intensive political indoctrination, which is the key NVA/VC method for maintaining troop motivation and morale. Working to lower morale are the hardships and realities of facing a superior allied force in the field. NVA recruits generally begin their service with high morale. Mostly from peasant backgrounds, life in the army is an improvement over the village regular meals, better medical care, and more entertainment and comradeship. The same cannot be said of the NVA recallee or the forcibly recruited VC. The latter, in fact, never knows anything but the hardships, which the NVA infiltrator soon comes to experience. POSITIVE FACTORS: The NVA/VC soldier is well indoctrinated. All NVA have lived in a Communist state, with its highly organized propaganda apparatus, Labor Youth Groups, and other Party organizations. The NVA recruit has been through a Party-controlled school system. The rural VC will have been exposed to some Party influence, the amount depending on the degree of VC control in his home area. In the army, political indoctrination comprises a major portion of training and is an important feature of life in all-military units. 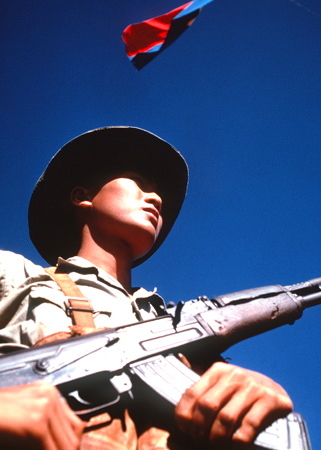 The units’ Military Party Committee, headed by the Political Officer, controls the political indoctrination conducted by the Propaganda, Training, and Indoctrination Section Emphasis in the indoctrination program is on the liberation of the South, reunification of the two Vietnams, and equality of the social classes, rather than on abstract Communist theory. Major themes are the revolutionary situation in the South, international situation, and anti- Americanism. NVA p re-infiltration indoctrination tells the soldier that two-thirds to four-fifths of the territory of South Vietnam already is liberated and that the vast majority of the South Vietnamese people will welcome him as a savior from the US invaders. The US soldier is said to be weak and unable to fight in the jungle. The NVA/VC have two techniques that are particularly effective in keeping troop motivation and morale high. The three-man cell is formed during training and, except for transfers and casualties, remains intact throughout the individual’s service. Each nine-man squad is divided into three cells. A squad leader, assistant squad leader, or senior combat veteran heads each cell. When a soldier’s morale is low, his cell comrades are there to talk to. They support one another in combat. The cell has the psychological effect of making the soldier feel that he is part of a unit and reduces his susceptibility to hardships and homesickness. The cell also insures that two individuals always are in a position to detect any wavering in the resolution or enthusiasm of the third. Unit political officers make frequent use of criticism and self-criticism sessions to impress upon the individual the knowledge that he must be correct in his conduct, diligent in his duty, and prepared to endure sacrifices. The sessions provide an outlet for emotional tensions and frustrations. Accomplishments are recognized and mistakes and transgressions publicly aired. The individual is both praised and humiliated and compelled to become a more loyal and ardent soldier. NEGATIVE FACTORS: The recalled NVA veteran and the forcibly recruited VC begin their service with low motivation. The indefinite term of service has an adverse effect on all NVA soldiers. With no rotation policy, the NVA infiltrator’s hope of ever returning home is remote; and the VC, although closer to home, is granted few leaves or passes. All are underpaid. The VC LF sometimes are not paid at all. The abbreviation of training in recent years has deprived the newer soldiers of the confidence that comes from the knowledge that he is well trained. There frequently is marked dissension among Northerners and Southerners, particularly in VC units having substantial numbers of NVA fillers. 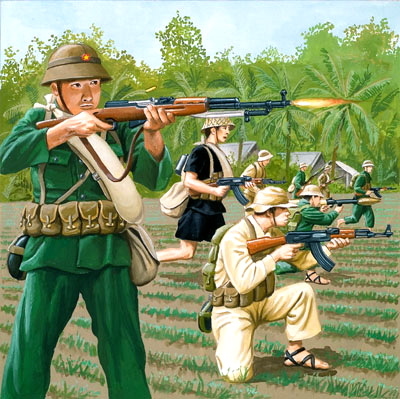 The NVA soldier is initiated to the hardships of fatigue, malnutrition and hunger, disease, homesickness, and fear of B-52 strikes and air attacks while on the infiltration route. These hardships continue when he arrives in the South. On the battlefield, the NVA/VC are exposed to these rigors more or less continuously, to which may be added Allied artillery and sweep operations and the prospect of death without burial or at best in an unmarked grave in a strange place. Disillusionment between the picture painted by the political officer and the reality of the war can be profound. Some enemy soldiers lost their motivation sufficiently to rally to the GVN. Others would rally, but for fear of the bad treatment their cadre have told them to expect from the GVN and its Allies, or fear of the consequences of discovery of their attempt by the NVA/VC. Still others, despite the hardships, disillusionment, and failures on the battlefield, continue to fight with courage and loyalty. I will obey the orders from my superiors under all circumstances. I will never take anything from the people, not even a needle or thread. I will not put group property to my own use. I will return that which is borrowed, make restitution for things damaged. I will be polite to people, respect and love them. I will be fair and just in buying and selling. When staying in people's houses, I will treat them as I would treat my own house. I will follow the slogan: ALL THINGS OF THE PEOPLE AND FOR THE PEOPLE. I will keep unit secrets absolutely and will never disclose information even to closest friends and relatives. I will encourage the people to struggle and support the Revolution. I will be alert to spies and will report all suspicious persons to my superiors. I will remain close to the people and maintain their affection and love.